American Bar Association (ABA) Criteria for Foreign Study - In addition to approving law schools in the U.S., the American Bar Association also approves foreign study programs for students who are currently enrolled in ABA approved law schools. American Institute for Foreign Study (AIFS) - Organizes cultural exchange programs throughout the world for more than 50,000 students each year. CEA Global Education - Founded in 1997 to provide international education opportunities and the highest quality student support for U.S. and Canadian university students interested in exploring global issues in exciting global cities. Today, CEA sends thousands of students every year on education abroad programs to locations in several countries, including Argentina, Australia, Chile, China, Costa Rica, Czech Republic, England, France, Germany, Ireland, Italy, South Africa and Spain. Cornell-Nepal Study Program - Courses are taught in English at the program facility and at the main Tribhuvan campus in the medieval hill town of Kirtipur, near Kathmandu, by Nepalese faculty from the Tribhuvan University Departments of Botany and Sociology/Anthropology. The CNSP is unique in its commitment to support the work of both Nepalese and North American students and faculty through a challenging academic program of classwork, research, and field work; in fact, it is the first and only study abroad program in Nepal to draw together students from American universities to live and study with Nepalese peers in residential program houses. EducationUSA: Site for Foreign Students - Assists international students with finding, applying, and preparing for study at an accredited U.S. college or university. GoAbroad - A comprehensive on-line source for study abroad, language schools, overseas internships, international volunteer positions, teach abroad, jobs abroad, U.S. Universities, Eco-Travel around the world, and more. iAgora - Work and study abroad solutions. IIE Passport - An information service of the Institute of International Education (IIE) - the nonprofit organization that is the largest and most experienced U.S. higher education exchange agency. Research information about organizations that offer U.S. education abroad, financial aid, and much more. Institute of Governmental Studies (IGS) - International center for overseas Americanists who study U.S. politics, public policy, and national, state, and local government. InterEdu - Online platform for international students interested in studying in Europe. Legal Study Abroad Headquarters - This site serves as a one-stop guide for law students everywhere: for U. S. law students who wish to study abroad, access information on enrollment in one of more than 100 ABA-approved formal study abroad programs or, alternatively, the creation of an individual study abroad program for a semester, year, or L.L.M. study at any law school in the world, or for non-U. S. law students who wish to study in North America, access information on enrollment in an American law school as a foreign exchange or L.L.M. Parsons The New School for Design - Parsons students who wish to study abroad have many options, ranging from summer programs to semester-long exchanges with partner institutions (for third-year students). Most application materials for study abroad programs are available on this site. Peterson's.com Study Abroad Offerings - Search study abroad programs, search summer-long programs offered overseas, search for colleges in the U.S., search for English language programs, find a graduate school in the U.S.
Study Abroad Links - Information on study abroad and educational travel worldwide. Resources and opportunities from around the globe. Study Overseas Site for International Education - Assist international students worldwide who are considering studying abroad in a country other than their own. It provides students, together with their parents and professional advisers with a free guide to international education information and opportunities. 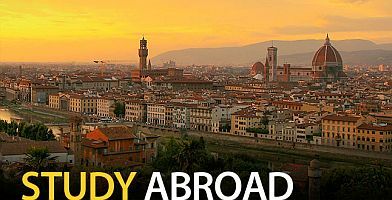 StudyAbroad - Here you will find listings for thousands of study abroad programs in more than 100 countries throughout the world. 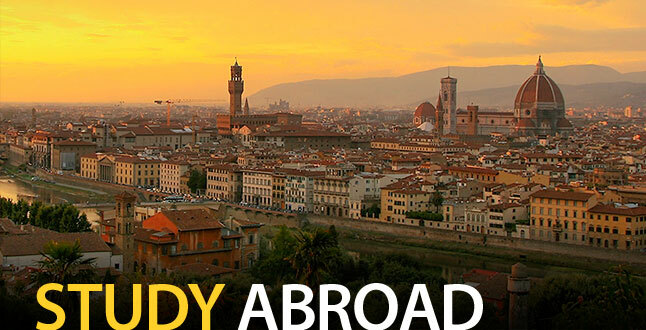 Use the Studyabroad.com network to link to hundreds of study abroad program home pages, explore study abroad destinations using complete travel resources, and discover opportunities and adventures in studying abroad. Top Universities - Country guides, course information and university rankings for undergraduate degrees. Rankings include domestic and international tuition and fees for top universities worldwide. Transitions Abroad - Portal for work abroad, overseas travel, study abroad and international living. This webpage last updated on Thursday, August 17, 2017 8:26 AM.